Looking for a wood burning stoves in the Ilkley area? Nearby are the North Yorkshire hamlets of Middleton (1 mile (1.6 km), Denton (2.7 miles (4.3 km) and Bolton Abbey (6 miles (9.7 km); the villages of Addingham (3.1 miles (5.0 km), Burley-in-Wharfedale (3.8 miles (6.1 km) and Menston (5.4 miles (8.7 km); and the towns of Guiseley (7.6 miles (12.2 km) and Skipton (9.4 miles (15.1 km). All these areas are served by the Leeds Stove Centre for the supply and installation of wood burning and multi-fuel stoves. The town of Ilkley is within the travel-to-work radius of Leeds and Bradford. Leeds is 18 miles (29 km) away and Bradford 15.6 miles (25.1 km) by road. If you have plentiful supply of wood, a wood burning stove or fire will be ideal for you and your home. A dedicated wood burning stove will be specifically designed wit hout a fixed grate, but with a flat base. When you burn logs, it is more effective that new logs are placed on a bed of ash to provide maximum efficiency and heat output from your wood burning stove or fire. 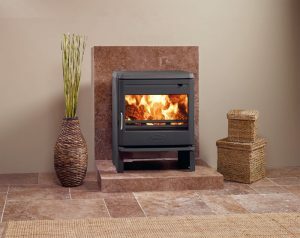 At the Leeds Stove Centre we aim to offer the widest choice of wood burning stoves possible to the area. We stock various designs and styles that are suited to different styled homes, we have a large choice of traditional styled stoves which would look fantastic in small cottages and more traditional homes. In addition to our traditional wood burning stoves, we also have a large choice of modern stoves which looks very stylish in modern homes or apartments. Despite the differences in their design, you will find that there is often little or no disparity in the heat outputs and efficiency levels of a wood burning stove when compared to that of a multi-fuel equivalent. It is also worth noting that both types of stove incorporate innovations in heating technology such as Airwash and Cleanburn, from which the majority of wood burning and multi-fuel stoves benefit. The former draws heated air down the inside of the stove door glass to protect it from soot and smoke and therefore keep it clean and transparent whilst the latter increases combustion by allowing pre-heated, secondary air into the firebox to burn the excess hydrocarbons in the smoke. We also have a stove showroom that is located within easy access of the Ilkley area, which features numerous examples of our wood burning stoves, many of which are live working examples. At the showroom you can get advice from our experienced staff whilst being able to compare stoves against each other. We pride ourselves on only offering the best quality wood burning stoves, therefore we only stock stoves from high quality manufacturers, including Yeoman, Dovre, Stovax, Mendip, Dik Guerts, Charnwood and more! Many of the stoves that we supply and install come with a manufacturers guarantee, so you can be sure that your stove is future proof and will last for many years to come. Each brand offers their own unique styles, finishes and accessories, you will be spoilt for choice! No matter what you choose, we are sure that you will benefit from the ambiance and charm that a real fire can bring to your home in abundance. In addition to selling multi-fuel and wood burning stoves, we also offer a full installation service. You must ensure that your stove is installed by a recognised competent person who is appropriately qualified in the installation of stoves and that the installation complies with all local, national and European building regulations. We have 3 teams of highly trained HETAS registered installers who can professionally install your stove, flue system and fireplace in your home. If your are interested in having our installation team install your stove, please don’t hesitate to contact us on 0113 255 5622 to arrange a free installation survey.